In the last two semesters Gudrun has taught the courses Advanced Mathematics I and II for Mechanical Engineers. This is a mandatory lecture for the International mechanical engineering students at KIT in their first year of the Bachelor program. This program is organized by the Carl Benz School of Engineering. Beside the study courses, the school also provides common housing for students coming to Karlsruhe from all over the world. The general structure and topics of the first year in Advanced Mathematics were already discussed in our episode 146 Advanced Mathematics with Jonathan Rollin. This time Gudrun invited two students from her course to have the student's perspective, talking about mathematics, life, and everything. Yueyang Cai grew up mostly in China. In 2015, the work of her mother led Yueyang to Stuttgart. While looking for opportunities to study a technical subject in Germany the English speaking program in Karlsruhe somehow suggested itself. After one year she is sure to have made the right decision. The second student in the conversation is Siddhant Dhanrajani. His family is Indian but lives in Dubai. For that he got his education in Dubai in an Indian community follwowing the Indian educational system (CBSE). He had never heard of the Engineering program in Karlsruhe but found it through thourough research. He is really amazed at how such an excellent study program and such an excellent university as the KIT are not better known for their value in the world. In the conversation both students talk about their education in their respective countries, their hopes and plans for the study course mechanical engineering and their experiences in the first year here in Karlsruhe. It is very interesting to see how the different ways to teach mathematics, namely, either as a toolbox full of recipes (which the students get well-trained in) or secondly as a way to approach problems in a context of a mathematical education contribute to an experience to be well-equipped to work creative and with a lot of potential as an engineer. Though the students finished only the first year in a three years course they already work towards applications and necessary certificates for their possible master program after finishing the course in Karlsruhe. G. Thäter, J. Rollin: Advanced Mathematics, Conversation in the Modellansatz Podcast, Episode 146, Department of Mathematics, Karlsruhe Institute for Technology (KIT), 2017. 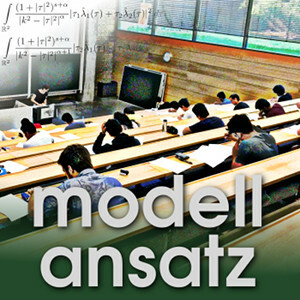 F. Hettlich, G. Thäter: Höhere Mathematik, Gespräch im Modellansatz Podcast, Folge 34, Fakultät für Mathematik, Karlsruher Institut für Technologie (KIT), 2014.